Ireland's oldest distillery is also its newest. Kilbeggan has been a continuously licensed distillery since 1757. It went out of business in 1953 but has been resurrected in recent decades through the combined efforts of the local community and Cooley. In 1989 spirit from Cooley's Riverstown base in Louth was brought here to mature in oak casks. March 2007 saw a small pot still fired up at Kilbeggan and fed with the output of an initial distillation at Riverstown. 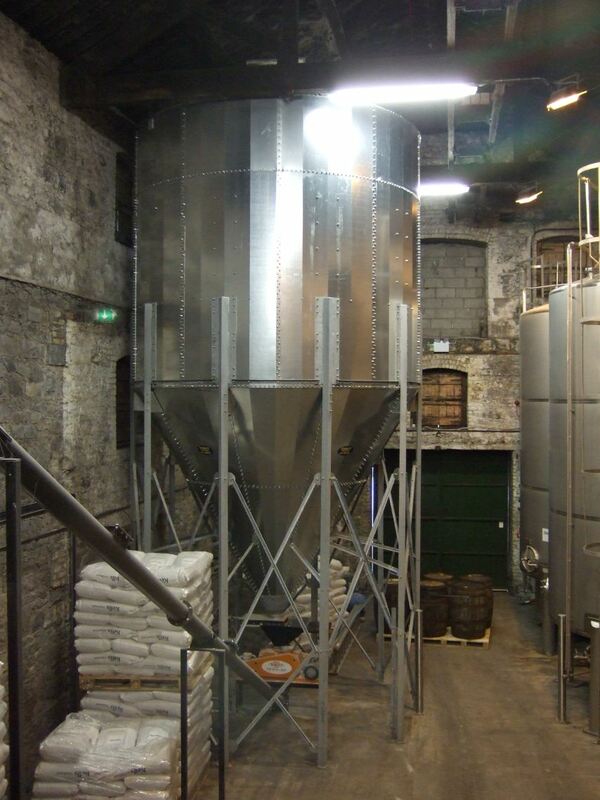 A second, larger still followed, along with the rest of the equipment required to turn raw grain into whiskey. 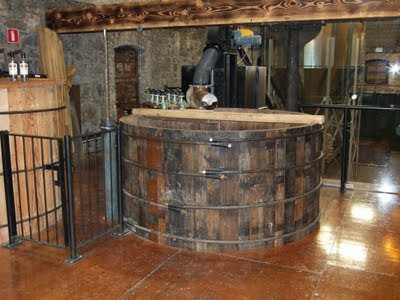 By August 2010 the revived distillery was once again mashing, fermenting, distilling and maturing. Cooley very kindly hosted an evening in the distillery recently and I had a chance to look over the whole process in the company of those who know the operation best. I took some snaps and scribbled down the various details below. Kilbeggan is open to visitors though, so I thoroughly recommend you contrive an opportunity to stop by to see it for yourself. And to taste the output, of course. It all starts with the grain. Here's the silo that holds 35 tons of malted barley. Every 3-4 weeks a lorry-load arrives from the Malting Company of Ireland. That's milled here to a grist by a two-roller mill. Up until this month, that would have been the end of the grain story. Malted barley is all you need to make malt whiskey. But as I mentioned before, they have just begun to produce the more traditional Irish pot still style of spirit. Using the old Locke's recipe (ie the recipe used up until 1953 in Kilbeggan), they are now adding unmalted spring barley and oats to the mix. 60% malt, 35% barley, 5% oats. The oats, it is said, are there to allow liquid to flow more freely through the bed of the mashtun. Alex Chasko, the Innovation Manager at Cooley, is sceptical about this, not having seen the effect in his experiments. Whatever about the filtering advantages, we are all hoping for an interesting influence on taste. The spring barley comes from Kells Wholemeal in Bennettsbridge, already stoneground. 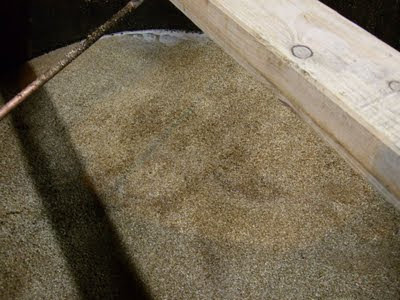 1,000kg of milled barley, malt and oats is conveyed to the mashtun, pictured below, where it is mixed with water at 65°C. In the mashtun, enzymes in the malt get to work converting the starch to sugar. It's common practice to fill the mashtun and drain it several times to extract all the sugar. Here, however, they are using a sparge arm to continuously and slowly add water as the sugary wort is drained from slots in the bottom. Here you can see the grain mash steeping in the mashtun. 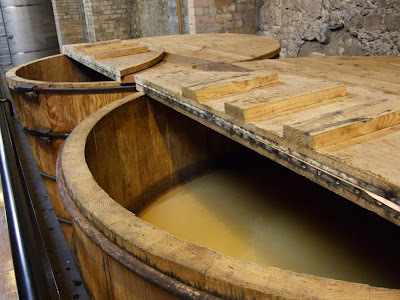 There are four fermenting vats at Kilbeggan. Two of them are pictured below. Each is 2.5m tall and can hold 6,000 litres. These are made from Oregon pine and were constructed new for Kilbeggan. 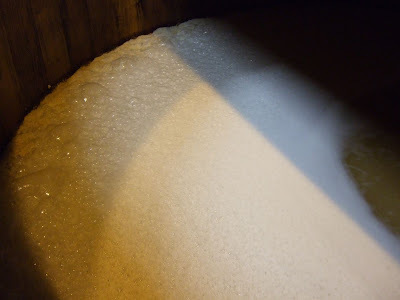 The sugary wort from the mashtun is filled into a fermenter and yeast is added. The yeast is M-Strain Distillers' Yeast from Kerry Group's yeast factory in Scotland. The yeast converts the sugar to alcohol. After 48 hours, the yeast is done and we now have what distillers call "wash" at an alcoholic strength of about 7%. Brewers would call it "beer". The fermenting vats are not cleaned between fermentations. This allows a natural fauna and flora to develop which apparently contributes lemon and peach notes to the distillate. Now that we have alcohol, we need to distil it. In Kilbeggan, the spirit is distilled twice, first in the large, new still on the left, then in the smaller, old still on the right. They run these stills slowly to get a delicate, soft spirit. Alcoholic vapour that is drawn off the top of the still is cooled in worm coils that sit in a water bath. This water bath is maintained at a warmer temperature than is the normal practice in Scotland. Again, this contributes to the refinement of the resulting spirit. And, of course, only the heart of the distillation is drawn off. The initial output (foreshots) and final output (feints) contain components that are less desirable in the finished product. The first distillation gives about 21% ABV, the second about 68%, I think. New make spirit, as it's called, can have a really strong smell of bananas and pears. 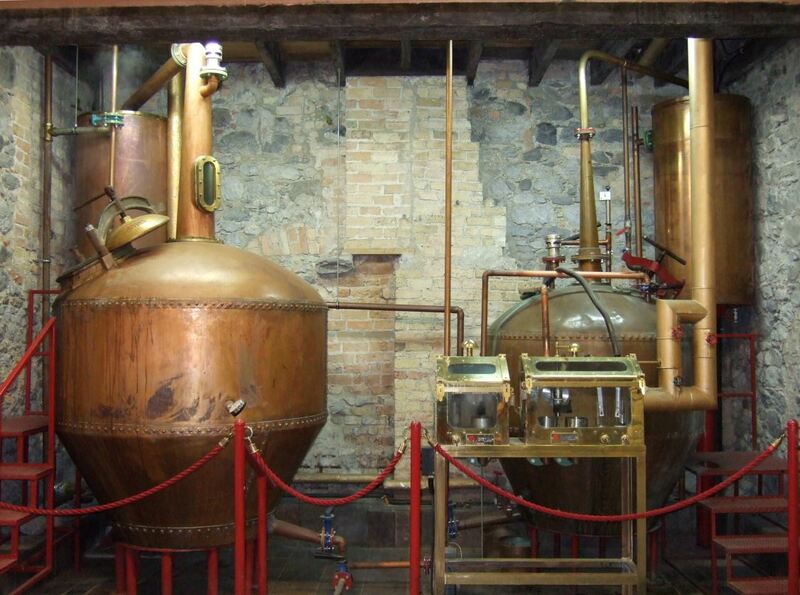 The pot still style spirit being made that night at the distillery is not as fruity. Instead it's more biscuity, or porridge-like, perhaps. I didn't find it all that pleasant to taste but that says nothing for how it will turn out once matured. Time in a cask changes a spirit entirely. We are all looking forward to trying the whiskey that results a few years down the road. Meanwhile Alex has a lot more experimenting to do. He mentioned, for example, a mashbill with 25% rye, and pushing up the percentage from there. Apparently there was a 50/50 barley/malt mix mashed and distilled at Riverstown a year ago. That's something else we can anticipate a taste of perhaps 2-3 years hence.